I love to marinate whole chicken breasts and then grill them to a juicy perfection to get flavor in every bite and enjoy the wholesome goodness of chicken. I have experimented with different kinds of marinating mixes and coriander marinade is one of them. 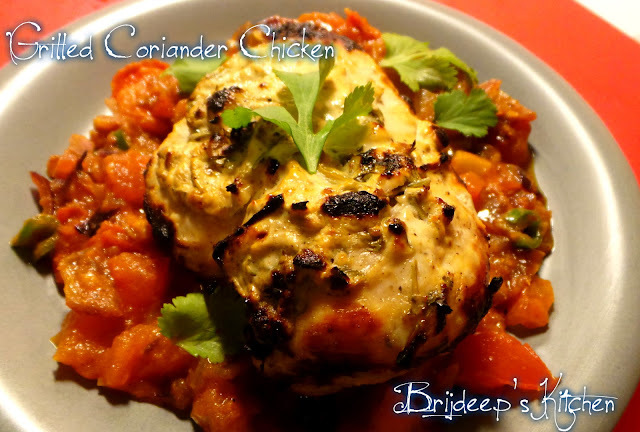 Today I'm writing about the coriander marinade and how to prepare grilled coriander chicken and sharing various different marinade mixes. 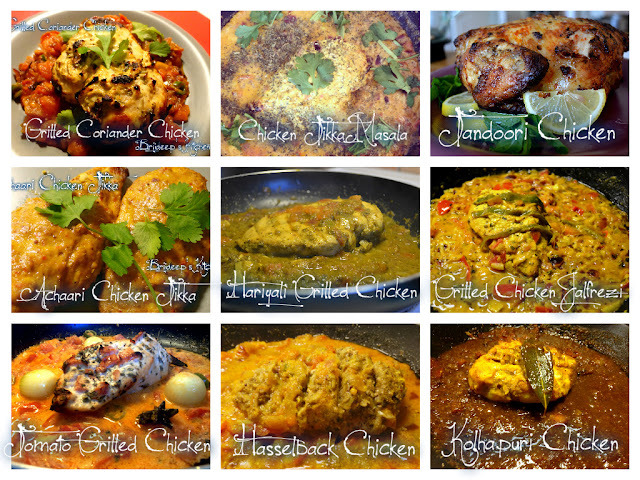 These marinade mixes can also be used for paneer or marinating vegetables to be grilled. Wash and clean the chicken breasts and make small cuts all over the surface of chicken. This is so that the marinade seeps in perfectly to produce the juicy flavor. Now mix all the marinating ingredients in a big bowl and marinate the chicken in this mix, cover and refrigerate overnight or at least 4 hours. Preheat the oven at 200 degrees C for 10-15 minutes. Oil the grill and keep the marinated chicken breasts over the grill and grill for 30 minutes at 150 degrees C. After 15 minutes do the knife test and if the knife comes out clean, turn off the oven and leave in the grilled chicken for 10 minutes. Remove the chicken from the oven and keep aside. While the chicken is grilling, we prepare the tomato masala bed. Heat oil in a pan and add the cumin seeds and asafoetida. When they crackle, add the sliced onions and fry until the onions start to become transparent. Add the tomatoes, ginger and green chilli and salt to taste and let cook until the tomatoes are soft and mushy. Add all the dry spices: red chilli, turmeric powder, cumin powder, coriander powder and garam masala. Mix well and let cook for another 2 minutes. Turn off the flame and take out in a serving dish. 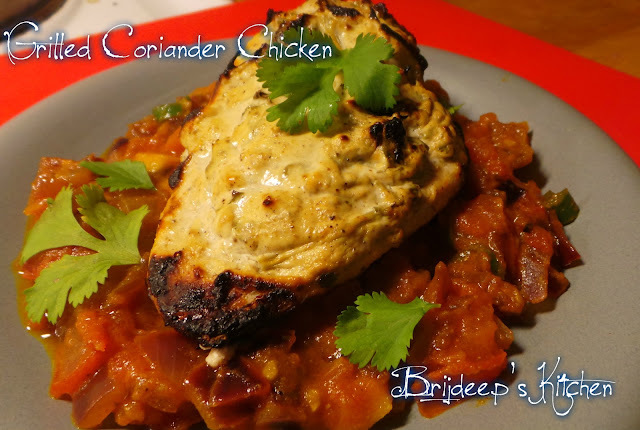 Add the grilled chicken to this masala bed and garnish with coriander leaves and lemon wedges. Sprinkle black salt if required and serve !! Now I will talk about the various kinds of marinades which I have used for grilling chicken. I hope this whole collection of marinating mixes will be useful. Please share feedback by leaving comments and if you love my recipes, don't forget to like my Facebook Page for regular recipe updates and join me on Pinterest.